I walked out the back door (our only door to the outside at the moment), and I'm so glad the first thing to be seen is the garden. There's the classic strawberry in a hanging basket, some timeless herbs like calendula, thyme, gotu kola and there's a small comfrey* plant amongst that mess. The Water garden was started a little late this year, but the plants don't seem to mind. The Kang Kong only just survived the winter being brought inside to take root in a jar in the North facing window. I lost all but 2 plants, and I realise now that I should have taken cuttings much earlier and brought them inside once they had established roots. I think I'll have a bigger plants than this by this time next year. The Chinese water chestnuts are amazing! I put about 8 in a paper bag, into a plastic container, into the fridge (an esky with variable temps) and left them there all winter. I opened the container a couple of weeks ago, and they looked ready to go, so I planted 4 of them into pots. A few days later, something hungry came along and ate 3 of them! 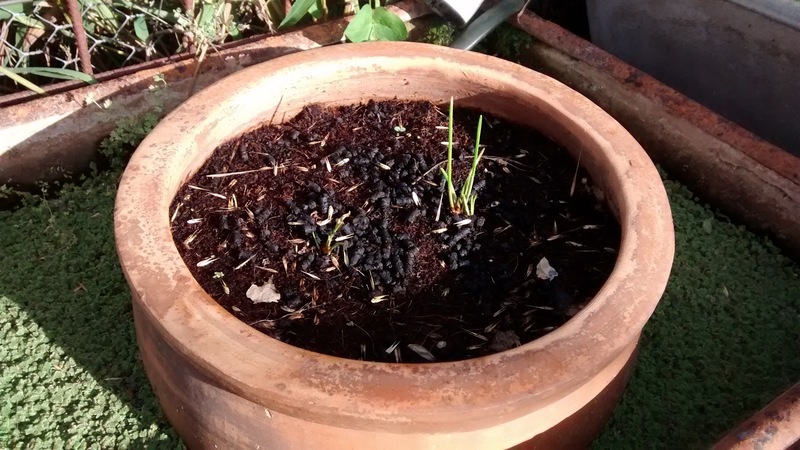 Looking at the ones I'd left behind, looking dry and done, I popped them in anyway and covered the pots to keep (choughs I reckon) hungry beaks at bay, and wouldn't you know they're sprouting now? The original one is doing great, so it's a small set back for the others, but considering how quickly these plants grow, I'm guessing we'll have too many again next year - and only from the two pots like this.. 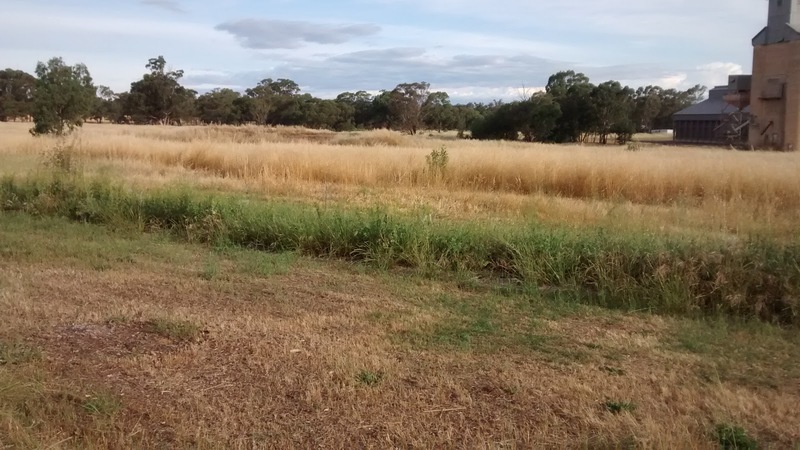 I took a walk around to inspect the trees, which is dangerous around here, and although I could be talking about brown snakes, I'm actually referring to the grass seeds that get stuck in your socks as you walk around. They burrow and get into everything, and it can get to the point when you feel like if you take another step, you'll break skin! I know, I know, that's why I should be wearing sock protectors.. and tracksuit pants are a definite no-no!! 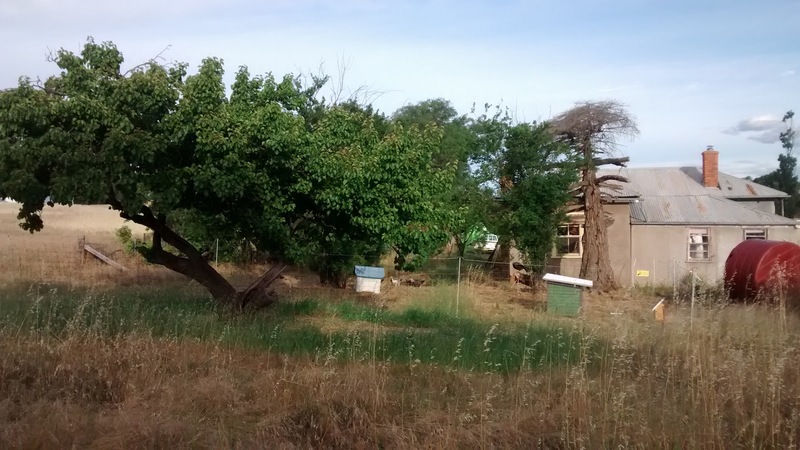 Anyway, we have moved the chicks away from under the apricot tree, and it's really responding to having the extra fertilizer. New growth, green all around. Amazing what chooks can do. 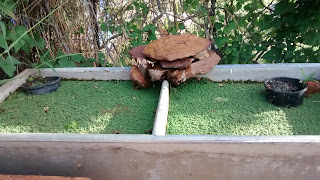 The hugel bed is more green than the surrounding area. We've had a little rain, and it responded right away. Many of the dead asparagus plants are suddenly putting up new shoots, and the green manure is green again. Amazing what a difference a little earth works can make! 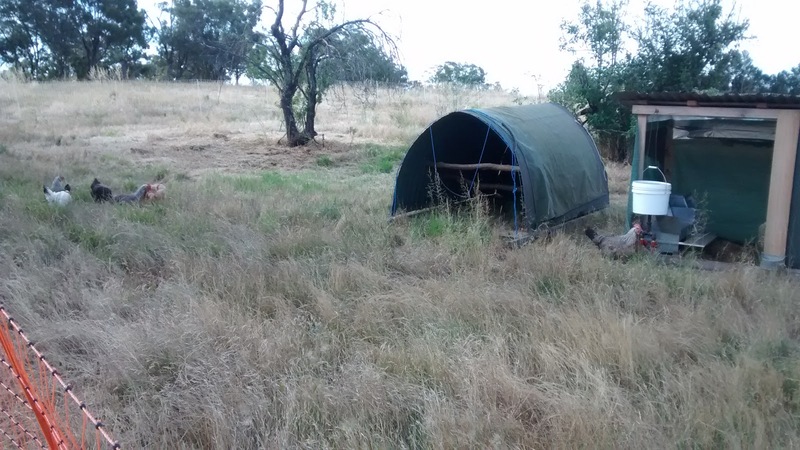 We finally got around to the major task of moving the chooks the other day. It normally would take us about 30-45 minutes these days, but we had moved them all the way down to the end of the property. Well and truly zone 5 stuff! The weather warmed up quickly, and we didn't want them to suffer the slow hops back toward the orchard area, since there are NO trees in between. So, we boxed them up at night, secured them in with the chicks, then used the tractor to drag the houses up to where they are now. We came back the next morning to set up the fence and let them out into it. 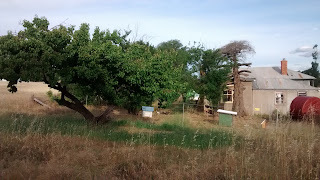 It's been almost a year since they were last on this ground, and even so, the fruit trees seem to be better off for it. Little pears are getting bigger, the quince is giving me hope (although, it did look hopeful last year as well, but the fruit turned black and died well before ripening). All the plants are looking happier this year. It could be the pruning our Permie friends did, the extra water we've had this year, the extra manure or all of those things combined. I think we've both decided that the orchard area is where we'll make the chooks permanent run, and move them around within it (or exclude them from certain areas where needed). It makes so much sense them being close to the house (especially the front door when we re-instate it), we can protect them and the fruit at the same time (from foxes, possums and wallabies/kangaroos), and they will keep fertilizing the trees and keep pests like fruit fly at bay, and gain the benefit of the shade in summer. 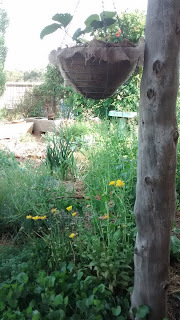 Now we just need to build it..
* Seems hiding the comfrey from the pests is working for now. The new Paterson's Curse Crown Boring Weevil is very effective at reducing comfrey numbers to nothing around here - but there's still a good amount of Paterson's Curse around, since the weevils are only just starting to do their thing, and the weed it's suppose to control has done finished flowering by now..